ORLANDO, FLORIDA–As you have noticed following @Knowmedge and @RaviBhatiaMD on Twitter, I had the pleasure of attending the American College of Physicians (ACP) annual conference last week. This is my first ACP conference and I must say that the vast knowledge of the speakers has been amazing; I’m excited to get to share bits of that with you in the coming days and weeks. While Twitter presents an opportunity for instantaneous proliferation of thoughts, this blog post allows a more complete overview. Since we’re finishing up celebrating #EndoWeek here at Knowmedge, I thought I’d begin by sharing with you the endocrinology pearls shared by Dr. Brandy A. Panunti, an endocrinologist at the Ochsner Medical Center in New Orleans, Louisiana. The American Diabetic Association recommends metformin to be given to high-risk patients to assist with the prevention of diabetes. Meanwhile, there aren’t any FDA-approved medications available for this purpose. For the purpose of the boards, it’s safe to focus on lifestyle modifications (diet/exercise) for diabetes prevention.This is demonstrated by the conclusion that 5-7% reduction in weight is a better intervention for the prevention of diabetes than metformin. Avoid metformin if the creatinine is greater than 1.5mg/dL in male diabetics and greater than 1.4mg/dL in female diabetics. Non-insulin diabetes medications assist with lowering the HgbA1c by 1 to 1.5%. Therefore, any patient with severe (or symptomatic) elevation of HgbA1c, should be considered for insulin therapy. The blood pressure target in diabetics of any age is less than 140/90mmHg. Don’t prescribe bicarbonate for the treatment of diabetic ketoacidosis on the boards since this is controversial. Since they don’t impact mortality, don’t check lipoprotein(a), apolipoprotein B, or homocysteine levels. I’ve had to remind my patients of this as these tests are commonly routinely checked but they don’t affect management. Just because a patient develops myalgia on a statin doesn’t mean they can’t be retried on that statin at a lower dose or a less potent statin. Fluvastatin is the least potent but is also expensive. No need to routinely monitor aminotransferase or CK enzyme levels in a patient with normal baseline labs. Statins have an increased risk of causing myalgia when combined with fibrates, macroides, calcium channel blockers, anti-fungal agents, and amiodarone. 1st step in evaluation is always to check a pregnancy test, FSH, TSH, and prolactin levels. If these are normal, perform a progesterone challenge test. Withdrawal bleeding indicates estrogen is present while no bleeding indicates a low estrogen level. Primary adrenal insufficiency is most likely caused by autoimmune adrenalitis. Secondary adrenal insufficiency is most likely caused by corticosteroid use. 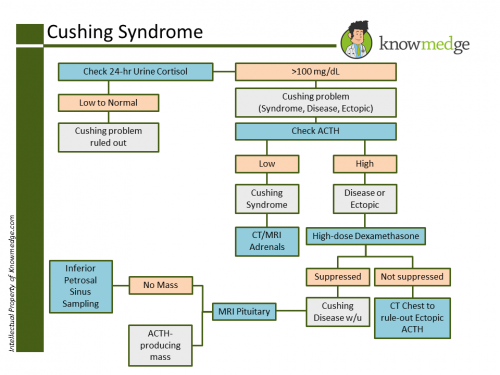 In the work-up of Cushing’s syndrome, if cortisol increases or fails to suppress with dexamethasone, measure ACTH. For a full review of “How to Work-Up Cushing’s” take look at Dr. Kumar’s previous blog post on this topic. Here is a high-yield image from that post. The most common cause of Cushing’s is exogenous use of corticosteroids. The most common endogenous cause is an ACTH-secreting pituitary tumor. A normal or increased TSH, increased T3, and increased free T4 are diagnostic of a TSH-releasing pituitary tumor as there is not the appropriate decrease in TSH from an elevated T3/4. Two major causes of no or decreased radioiodine uptake scan is destructive thyroiditis or exogenous T4. 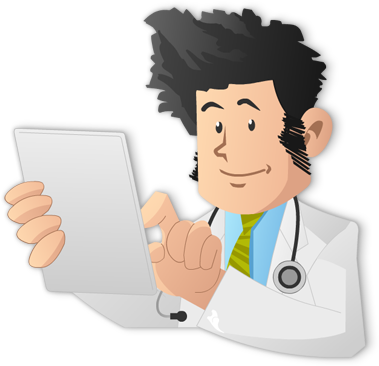 A patient taking methimazole or propylthiouracil who develops a fever and/or sore throat must have a CBC checked stat. This patient is at high risk for agranulocytosis. Treat subclinical hypothyroidism if the TSH is greater than 10microunits/mL. Or you can recheck once before starting therapy. I hope this overview of Endocrinology, as presented by Dr. Panunti, helps with your preparation of the ABIM board, Internal Medicine shelf, or USMLE Step exams.